In the search for new alloys, metallurgists are guided by the empirical Hume-Rothery rules, which state that two elements can form an alloy only if they are similar in atomic size and electronegativity. 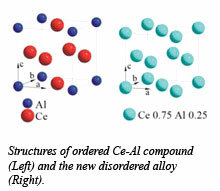 Cerium atoms are 28% bigger than aluminum atoms, and have a significantly lower electronegativity, and on the basis of the Hume-Rothery rules, seem to be incompatible with respect to the formation of an alloy. Both cerium and aluminum do, however, form many useful alloys with other metals, and can even form chemical compounds together, as well disordered mixtures called bulk metallic glasses, but a cerium-aluminum alloy would apper to be impossible. Applying pressure, Qiaoshi Zeng (HPSynC) and co-workers from Carnegie, HPCAT, Stanford University, PNC-CAT (APS), Uppsala University, and the Stanford Linear Accelerator Center induced these elements to alloy, transforming crystalline and metallic glass Ce3Al into similar substitutive alloys. Using diamond anvil cell and synchrotron radiation techniques at the HPCAT sector of the Advanced Photon Source, transitions to the alloy phase were observed by x-ray diffraction to occur at 15 GPa for the crystal and 25 GPa for the glass. Once formed, the alloys persisted when the pressure was released. It is suspected that the Kondo volume collapse of cerium at high pressure causes its 4f electrons to delocalize, reducing the difference in size and electronegativity between the two types of atoms. Pressure-induced delocalization may therefore be a promising route for making novel alloys with unusual electronic and magnetic properties. The properties of the new alloy are currently under investigation, with one key finding being that after quenching, the delocalized electrons become localized again, suggesting that the alloy may retain some of the magnetic properties of cerium. Rare earth elements such as cerium are components of the strongest known magnets, and the new alloy could therefore have novel electronic and mechanical properties. 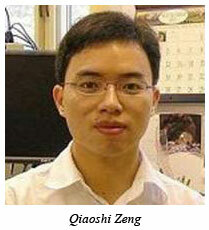 This work has been published in the Proceedings of the National Academy of Sciences [Zeng et al., Proc. Nat. Acad. Sci., 106, 2515-2518 (2009)].